Valentine’s Day is coming up on Sunday, and we’re celebrating all week with love letters from the literary world. 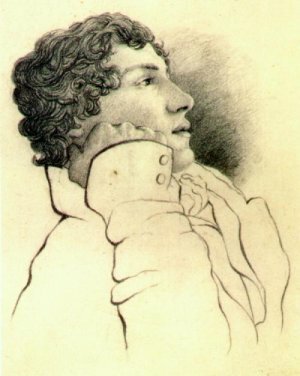 Poet John Keats (books by this author) lived to be just 25 years old, but in that time he wrote some of the most exquisite love letters in the English language. The letters were to Fanny Brawne to whom he became engaged. This moment I have set myself to copy some verses out fair. I cannot proceed with any degree of content. I must write you a line or two and see if that will assist in dismissing you from my Mind for ever so short a time. Upon my soul I can think of nothing else. The time is passed when I had power to advise and warn you against the unpromising morning of my Life. My love has made me selfish. I cannot exist without you. I am forgetful of every thing but seeing you again — my Life seems to stop there — I see no further. You have absorb’d me. I have a sensation at the present moment as though I was dissolving — I should exquisitely miserable without the hope of soon seeing you. I should be afraid to separate myself far from you. My sweet Fanny, will your heart never change? My love, will it? I have no limit now to my love … I have been astonished that Men could die Martyrs for religion — I have shudder’d at it. I shudder no more. I could be martyr’d for my religion — love is my religion — I could die for that. I could die for you. My Creed is Love and you are its only tenet. You have ravish’d me away by a Power I cannot resist; and yet I could resist till I saw you; and even since I have seen you I have endeavored often “to reason against the reasons of my Love.” I can do that no more — the pain would be too great. My love is selfish. I cannot breathe without you. Keats and Brawne became engaged. He wanted to earn some money for them before they got married. But then he began coughing up blood. When he saw it, he said: “I know the color of that blood; it is arterial blood. I cannot be deceived in that color. That drop of blood is my death warrant. I must die.” He wrote to tell her that she was free to break off their engagement since he would likely not survive. But she would not, and he was hugely relieved. But he died before they married. Previous Allusions are no illusions.